Several years ago I had a bit of a run in with a certain online retailer by the name of "FooBar Pty Inc". Obviously this isn't the company's real name, but given I had an opinion about this company and it was a negative one, they decided my words were far too bad for business so threatened legal action if I didn't remove them. I obliged by removing their name and products from the posts and comments. It's dated 21 March 2009, which is about 8 months before my run in with them. 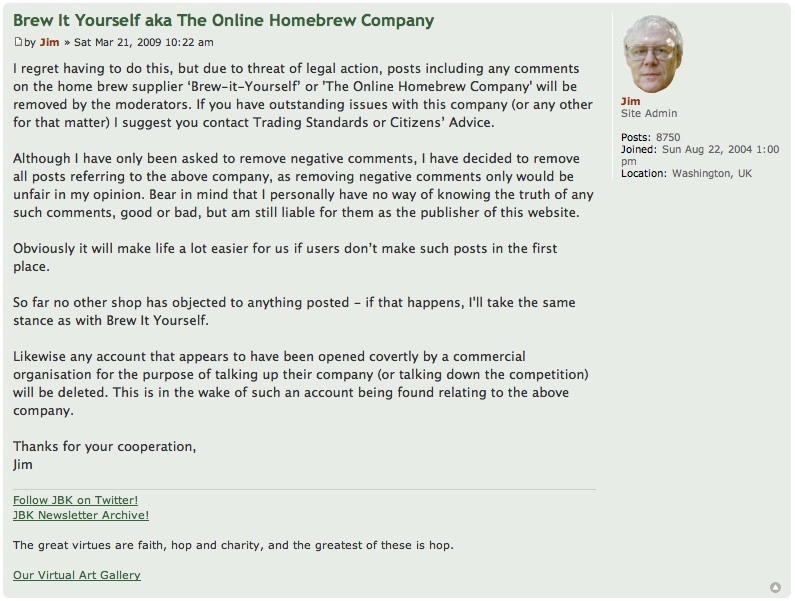 I have no idea how I missed this post all this time as I regularly turn to the Jim's Beer Kit forums when I'm thinking about trying something new in brewing. I'm glad I'm not the only one who they threatened. To this day, I have gone to more reputable companies, even if it means spending a little bit more. I think these legal threats, especially against a large community forum (which of course is a competitor to their own forums), have probably had more of a negative impact on their business than a few negative reviews would. Big spenders will always consider negative reviews and take them with a pinch of salt. It's hard to ignore threats of legal action. Oh well, it's their business, not mine. They're free to run it how they like. Naturally, comments are disabled on this post.